sailboat. 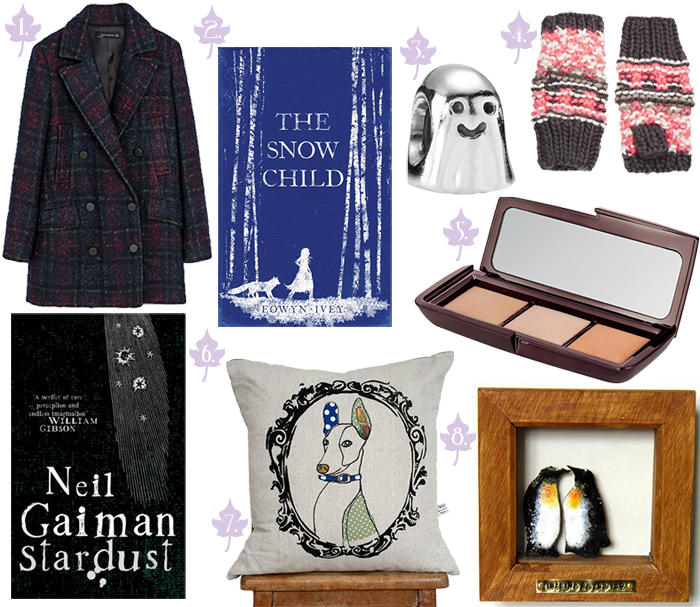 : Currently Coveting: Books, Warm Checked Coat & Home Decor. Oh gosh, you definitely need to get into Neil Gaiman! I'm currently reading Neverwhere which I definitely recommend...I think The Graveyard Book is my favourite of his but The Ocean at the End of the Lane is also good ha! That coat is beautiful Jennie! The Snow Child is one of my ever favourite books! I love the plot - it is like a fairytale in a realistic, cold Alaskan setting. When I finished reading and ended up in tears, staring at the last page for couple of minutes! I found it absolutely enchanting! These are all such pretty items. I'm always keen to see what home decor items you're interested in as I really like the style and feel of the things you choose. The Zara coat is amazing! Stardust is quite a sweet story. I like the film adaptation too. Neil Gaiman's work is definitely an interesting experience. Some of his work is quite disturbing but Stardust isn't. Aw that penguin frame is so cute! My best friends is obsessively in love with penguins :-) I bet he'd love this. oo that Zara coat.. I am speechless. I made a vow to not buy any new coats this winter but you just made it very very hard! That coat is very nice! Finding a good winter coat is always quite the search, luckily I found a coat last year that I still love to pieces and will gladly wear all winter long again this year. I've never read a Neil Geiman book either, but I'd love to read one of them. I've heard so many good things about his writing and the stories he created! I love the penguin couple, so sweet! The Pandora Ghost charm is really cute, too. I neeeeed that ZARA coat! I have more love than is normal for the penguin couple - beautiful. Penguins are my favourite thing but those are soo sweet. I love the snow child cover it's gorgeous the book looks fab too. The hourglass palette is beautiful. Even the packaging has me excited! I think this is way over my budget. Maybe a lovely family member will buy it for my Xmas! that ghost charm is so precious! i've never had a pandora bracelet but have definitely been wanting one for years. and i'm with on you on the hourglass palette... it's shot right up to the top of my wishlist ever since i first found out about it... the price tag is the only thing that's holding me back right now! I'm sighing over all of these, especially those two penguins in the frame - just too cute. That coat is really nice. I've also looked up that hourglass powder set and did a little yelp at the price. I've heard it's also very small and hard to swirl a brush around in each one. I must check these books !! I always love all of your home pieces you pick, I'm also lusting after the hourglass ambient powders! Very cute coat - I can see it becoming a winter staple! The Hourglass Ambient Lighting powder palette seems to be recurring feature on a lot of wishlists - understandably :) Genius idea. This is the epitome of winter!